After Sweetie Belle nearly demolishes Carousel Boutique When unfortunate circumstances force Rarity to cancel the Cutie Mark Crusaders’ sleepover at her Boutique, Fluttershy graciously offers to take the trio for the night. Good with animals, good with kids, right? Nnnnope, not with these troublemakers. Poor Fluttershy learns far too late that trying to keep these kids down is an exercise in futility, and soon finds herself facing off against a deadly foe to try and extricate them from the danger they had run into headlong and clucking. So let me just begin by saying that the opening to this episode reminds me very much of old stories I would write whereby some innocuous activity such as sledding down a hill would result in something ridiculous like the annihilation of the entire planet (sledder loses control and crashes into a tree, tree had been growing into some power lines and the jolt causes it to jumble the wires and leads to a blackout, sudden outage causes someone in a nearby fancy Greek restaurant to trip and drop a plate of flaming saganaki onto some frilly curtains which immediately catch fire, etc. etc. nuclear reactor etc. etc. massive science experiment etc. etc. and the resulting shockwave knocks the planet’s magnetic field out of alignment such that there is no shielding against a solar flare that just so happened to be heading to Earth at that very moment and the planet gets roasted, etc.). Sweetie Belle seems to have the natural gift to be able to do just that, though fortunately her damage output remains more localized. 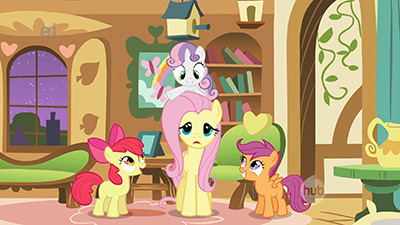 That said, you would think that Rarity’s ability to levitate dozens of objects at once (as portrayed in Suited for Success) would allow her to stop that cascading catastrophe in its tracks, but then there wouldn’t be a reason for her to have to cancel the CMCs’ sleepover, which means Fluttershy wouldn’t need to take them to her cottage for the evening, which means their wacky adventures wouldn’t have happened, which means this episode would be rendered meaningless, which means the writers would have had to etc. etc. nuclear reactor etc. etc. and the resulting shockwave would… well, you know what I mean. We also wouldn’t have gotten the line, “I thought the open sign meant you were open, but I must have been mistaken.” Or, for that matter, Opal slicing through Sweetie Belle’s mane and then giving her the most exquisite horseapples-eating grin we’ll see for a good long while. 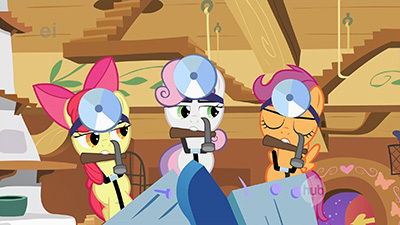 Ah, the Cutie Mark Crusaders. These three were cute when they were first introduced, but to be honest I was okay with them kind of fading back into the background. But now they’re front and center again, and they’re moving from “three cute fillies” to “a trio of twerps” and even into “rotten crummy kids” territory. Sure, we’ve seen Applebloom do a great job at getting herself into loads of trouble on her own, but we’ve also seen her make some mature choices, too. But it seems that once Scootaloo and Sweetie Belle enter the picture, that more mature side of Applebloom (the one I quite prefer) is summarily defenestrated and the three transform into a whirling dervish of catastrophe and bad ideas. Evidently Fluttershy is the only pony who has not seen their relentless frenzy, as both Rarity and Twilight have to do an, “Equestria to Fluttershy, are you sure you’re thinking this through?” when she offers to take them for the evening. It’s a bit of adorably tragic naïveté on Fluttershy’s part to assume that since she’s good with little animals then she’s good with little kids as well. She probably would have had better luck treating them as little animals, since that’s what they are, after all! I suspect those viewers of the “target demographic” who see this episode will fixate on the CMCs’ antics and view Fluttershy as a fuddy-duddy who is no fun. After all, being a kid is all about running around and causing a ruckus, right? Adults are there to ruin the party by telling you to go to sleep or to keep it down or to eat your vegetables. But who needs adults anyway? KID POWER! And yes, I admit I went through that mindset as well… who hasn’t? And how else are you going to have hilarious scenes like HAMMER TIME! if you’re not allowed to break the rules and go wild a bit? But as an adult, I see this episode and fixate on the grown-ups’ struggle to keep the CMCs under control without being mean or overbearing. I think back to my parents and my friends’ parents and my old babysitters all trying to keep a lid on the crazy sleepover parties, or trying to stop us from holding every stick we could find over the campfire to watch it ignite far too close to our hands, or getting us to stop playing so many video games that were undoubtedly melting our brains, all the while trying to be loving yet firm. It’s a testament to the wonderful writing that goes into this show: the CMCs’ dominance over Fluttershy isn’t portrayed as some crusade against an evil Dictatress of Boring, and Fluttershy’s attempt to wrangle three crazy kids isn’t portrayed as some desperately futile attempt at clinging to whatever shred of sanity is left. Rather, the two meet squarely in the middle such that the episode can be appreciated from either angle with equal strength. As an aside, I wonder how Look Before You Sleep would have gone had Fluttershy been there instead of or in addition to Applejack and Rarity: the contrast of Twilight’s “here are all the wild and exciting things you need to do in order to have a successful sleepover!” and Fluttershy’s “we can sit quietly and color!” would have made for some amusing and interesting interactions. Fluttershy’s “Stare” talent is a curious element, one about which I have mixed feelings. On one hoof, it offers an extended explanation (the primary explanation hasn’t really been described in detail yet) as to how she’s seemingly able to get animals to bend to her will with little effort, up to and including giant dragons (I’m convinced that what we saw in Dragonshy was an early glimpse of The Stare; I’m also convinced that her assertion that she has no control over it is a complete lie… she knows full well what she’s doing). 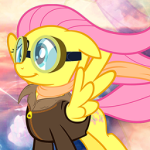 But on the other hoof, it adds a slightly weird color to Fluttershy’s character: if she doesn’t kill you with kindness, she can just launch a psychological death ray at your face instead. It also opens up the creepy proposition that Fluttershy could brainwash herself an entire army of woodland creatures to do her bidding (or worse, somepony else’s bidding) were things to come to that. But if there’s one thing that Fluttershy is good at, it’s keeping her powers (be they mind control, freaky knowledge of sewing, shielding her friends when Celestia throws the sun at them, or otherwise) tucked well away and only bringing them out when the alternatives have been all but exhausted. Which brings us to the point of the episode where her alternatives have been exhausted: the cockatrice. That’s three dangerous beasts Fluttershy has tamed: one with a little kindness and two with psychological obliteration a stern talking-to. For some reason, though, confronting the cockatrice seems to be the scariest adversary yet, despite being the smallest. I mean, getting torn to ribbons or burnt to a crisp is scary and all, but as far as I’m concerned, getting turned to stone just by looking at something is the most frightening prospect. And yet Fluttershy takes it head-on, knowing full well that there’s quite a non-negligible chance that she’ll get petrified like Twilight in the process. 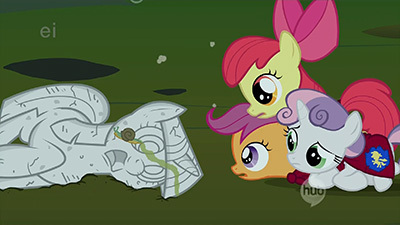 Fortunately, Everfree Forest cockatrices apparently have the ability to reverse their petrification process, so at the end of the day getting stoned in Equestria isn’t all it’s cracked up to be. Okay, poorly-executed pun is poor. Oh, by the way, did you notice the snail crawling on Twilight’s face is the same color as Snails the pony? I’d say that’s quite clever, but I also say that scene is gross. It’s like kicking somepony when she’s down, but much more slowly and with more mucous. Ick. Despite this being a Fluttershy-heavy episode, it’s not really one of my favorites. Nonetheless, it’s still an enjoyable and fun slice-of-life romp through just another day in the life of a Ponyville citizen in which mortal danger is always lurking right around the corner! For a parting song, here’s something a little different: me playing an ITG-ized version of a remix of a remix of Sweetie Belle’s remix of Fluttershy’s lullaby at the arcade (yes, the meta is real). Also known as Sleepyhead (ArtAttack Remix), by UnderpΩny. Plenty of energy… much like Sweetie’s rendition itself! And for something on the spookier side, let’s go with Petrified (ft. Mic the Microphone) by H8_Seed. Intense. And for something on the random side, Got My Party Cannon (Scootaloo Chicken’s Theme) by ElectroKaplosion. (Warning, very mildly spoilery if you haven’t yet watched through Season 1.) I think this song pretty much sums up the whole “Scootaloo is a chicken” meme that this episode spawned! I actually think this episode did a pretty good job of rendering itself meaningless, Gerf. Which isn’t to say it’s bad, as it certainly has a lot of fun shenanigans going on, and like Gerf pointed out, I like how both the children and adults are set as opposition without it becoming animous or painting a clear protagonist/antagonist between them. But what was the ultimate point of the episode? What was explored? What was learned? What was educational or informative about it? While watching the episode, I was very much reminded of the misadventures Huey, Dewey, and Louie would have in Duck Tales as they banded their child minds together to face adventure and danger, but in doing so, they were often quite capable and inventive (even when not relying on their magical Junior Woodchuck Guidebook) and often triumphed over adversity and saved the day. Sweetie, Apple, and Scootaloo don’t get that. The lesson about them having boundless potential has been swept aside as they’re all painted as failures who excitedly make a mess of everything, and instead of them using teamwork to put their heads together and triumph where none of them is capable of doing anything individually, they all just fail together. There’s a lesson that could have been taught here, about bonds and friendship, but we instead just triple the ineptitude for gags of things failing with increasing spectacularity. And then a Medusa chicken snake shows up out of nowhere and the entire climax becomes about Fluttershy’s The Stare, which is really lousy storytelling and doesn’t evolve the climax out of what the story’s been building toward. There is no lesson learned between the babysitter and babysitties, no deeper understanding or bond forged or lesson taught, no triumph of teamwork. No, we just get a random monster and a visual gag of Fluttershy’s peeved glare somehow superseding a supernatural beast’s natural born abilities. I get it, ha ha, its funny, but what’s the point of it and why are we going there all of a sudden? Again, it’s not a horrible episode, and I’m probably coming off a lot more frustrated by it than I actually am. It’s cute and snappy and entertaining, but also poorly thought out and ultimately doesn’t have much of a point to it. This is a very good Fluttershy episode. It’s also a something of a mediocre CMC one. Which kind you take it as is mostly up to the viewer (it’s presented really as both equally), but I fall more on the side of Fluttershy being the larger focus, as she’s the one actually thrown face to face against both problems presented to her and is also arguably the only one out of the two sides to come away learning anything (the lesson is presented as applying to the Crusaders also but it’s questionable whether or not they learned anything as they’ll go right back to getting themselves into trouble down the road). I disagree with Noel, the lesson is pretty clearly there and isn’t even particularly obscure, as at least on Fluttershy’s side of things it has its attention called to it pretty early in the episode, with both Rarity and Twilight questioning whether Fluttershy really understands the job she’s taking on and how much of a handful watching over the three kids will be. On her side it’s actually a rather rare show of her ego coming forward, as she decides right away the job falls under her expertise and that taking care of kids will as easy to her as taking care of animals is, and spends half the episode not admitting to herself that she completely underestimated what she was getting herself into. Her struggle with the CMC at the beginning of the sleepover as she goes between total bewilderment at their antics to stern outbursts that are immediately dialed back as she backpedals away from trying to yell at them to get them under control. In part that can be chalked up to her issues with being stern and assertive in general, but on the other hand I have to wonder if there’s part of her trying desperately to convince herself that she can handle this without having to resort to yelling. When she (mistakenly) thinks she’s managed to get the situation under control by putting them to bed, her worn out declaration that she is just as good with kids as with animals sort of drives it home – she doesn’t want to be wrong about that. It’s not until she realizes that she accidentally let the three go into the Everfree Forest while under her care that she finally admits to herself (and later to Twilight, although interestingly not to Rarity) that she’s out of her depth. Fortunately, the larger problem that the CMC wind up face to face with in the forest is within her wheelhouse, and she’s able to salvage the situation with a bruised ego being the only real casualty. While the CMC arguably don’t learn the same lesson, it still applies to them, as ultimately the problem caused comes from them charging headfirst into a much-too-large situation thinking they’re prepared for it when they obviously aren’t. As for the Crusaders, I like this episode for them as a lead-off from the group’s formation (since this is the first episode with them we’ve gotten since the three met each other), and we do get to see them in action doing their thing. It’s something of an expansion on the idea that Rainbow Dash put into Applebloom’s head a few episodes back, namely the best way for the group to get their cutie marks being to try every possible thing they can think of in the hopes that they’ll stumble upon something they’re good at in the process. Unfortunately this comes along with the boundful energy and lack of concern for consequences that goes along with being a child, and their experimentation often leads to chaotic and occasionally destructive results. Yes, they’re largely incompetent in the things they try, but really, they’re kids, and ones who are effectively blindly throwing darts and hoping there’s a dartboard somewhere within a mile radius of the direction they’re throwing them. The point and strength of the characters as a team isn’t in them collectively beating the odds and triumphing over adversity (often their episodes involve trying to set problems they caused right and just getting back to the baseline, and it will be a very long time before we see them claim any great accomplishments), but rather in their determination to never give up, to pick themselves up and dust themselves off after their failures and keep going. If the DuckTales incarnations of Huey, Dewey, and Louie at their best embody the hyper-competent Smart Guys armed with a Great Big Book of Everything tropes (and it’s worth mentioning that the characters had quite a bit of character development under their belts even at the start of that series as they certainly didn’t start out that way at their inception), the Cutie Mark Crusaders embody the Determinator. Unfortunately where this episode stumbles for them is that we don’t really get to see that at play. The consequences of their problem-causing don’t actually fall on them, as the worst they have to face is having their slumber party moved to a different location. Everything else gets solved for them, and as a result we don’t really get to see them actually have to deal with anything their antics are causing. There’s not much growth or progress that can really happen in that situation, but then, this is only the first episode in which the team has been established. Ultimately, their lack of engagement with the plot is the reason why I consider this a Fluttershy episode that features the Crusaders rather than the two sharing the spotlight in equal parts. We also get introduced to the concept of The Stare in this episode. Whether or not Fluttershy’s ever used it prior to now is debatable (she may have used it on the Dragon before, but it didn’t quite look the same and lacked the audio cue that accompanies every other use of it she’ll do), but this is the first time it’s been called out by name. It’s Fluttershy’s trump card for dealing with animals, and seems to be more than just a stern gaze combined with talking them down, it’s apparently some kind of willpower-sapping mental pressure ability, although how exactly it works never gets entirely explained (similar to Pinkie-Sense in that regard, and both are concepts that will resurface as relevant to the characters now that they’ve been introduced). I really like the ultimate confrontation with the cockatrice, as it’s an exceedingly brave moment for Fluttershy. She actively wants to avoid having to deal with it, and only really makes the call to directly stare it down when it’s clear that the kids aren’t going to be able to run away from it, and so puts herself between it and them. Which, all things considered, is a ridiculously dangerous situation to be in, since had she lost the battle of wills with the creature (which she couldn’t have been completely sure she’d be able to do) she would have wound up turned to stone completely (which is an ability actually attributed to the cockatrice in myth, so kudos to the writers for that). There appears to be more than one way to undo that kind of thing, as Fluttershy seems pretty convinced that she can help Twilight before finding the creature, but we don’t know if anyone else would have known how, and it would have been enough of an undertaking to rescue two petrified ponies (five, if the CMC didn’t make use of the time Flutters bought them) that she was still taking a sizable risk to protect them. Also, Noel, Fluttershy didn’t supersede the cockatrice’s ability with her own, but rather she got it to back down and undo it. Granted, she convinced it through the use of her own ability, but that’s not quite the same thing as her ability canceling its one out. Also I’m not sure where you’re finding the visual gag in the scene, since none of it was really being played for laughs. While we don’t get much time between the two of them in this episode, I really like the groundwork being laid here for Rarity’s relationship with Sweetie Belle, with the younger sister eagerly wanting to help and the older one really wanting her out of her hair while she’s busy. 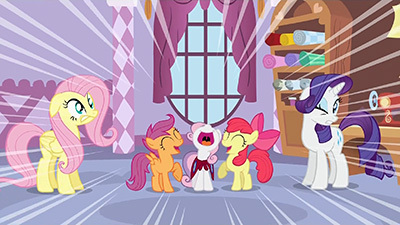 Sweetie Belle clearly idolizes Rarity, imitating her word for word and attempting to create outfits for her group in an effort to be just like her big sister. I like the dynamic between the two of them a lot, and this lays the foundation to be able to explore it in detail with them later. On a final note, “Hush Now, Quiet Now” is sung by Michelle Creber, who both voices Applebloom and supplies the singing voice for Sweetie Belle (who is normally voiced by Claire Corlett. Scootaloo is voiced by Madeleine Peters, just so we don’t leave her out). I don’t have too much to say about the song itself other than that I really like that Sweetie Belle’s version of it winds up being a rare non-depressing version of lyrical dissonance, as she turns what is supposed to be a lullaby about being quiet and falling asleep into a high energy loud gospel-esque tune. The point I’m trying to make is that, in the episode where they were introduced, the entire lesson for the CMCs is that they shouldn’t worry about what their place in their Marked society is, that they have open potential and it’ll come to them naturally, so it was neat seeing them bond over this lack of a societal identity norm and be there for one another. By making their plots all about an echo of Applebloom’s attempts to forcefully find her Mark, I feel it regresses them and makes them less interesting as characters. That’s why I think so much more could be done to have them put their heads together in a proactive way instead of a destructive way. The way they’re written here feels like the ways kids are written in shows for adults: adorable annoyances, “kids being kids”. But this show is supposed to be for kids, and I don’t get what this is supposed to say as it sets out to speak to them. As for Fluttershy, I’ll grant you, she’s awesome. I don’t find her “Kids will be easy!… Kids are hard!” a compelling enough arc to be a lesson, but it is fun to watch and her hero moment at the end is great. I just argue it’s still not right for the episode. As you say, Tessa, the first two thirds are focused on the Crusaders, yet they never have a payoff to complete their story. We instead shift to a completely different story, about a cockatrice on a loose and a petrified Twilight. These come in way too late to be anything but rushed additions to wrap up a story they didn’t know how to finish, so I stand by this being sloppy storytelling and wish they’d saved the cockatrice bit for its own episode, because as fun as it is and as great as Fluttershy is, it doesn’t make the episode any better to have such a forced and visible shift in there. My point is that Huey, Dewey and Louie didn’t originate in DuckTales. In that particular cartoon they hit the ground running, sure, but they’d been in existence for quite a long time before that, in both cartoon and comic form, and it took a while for them to become what they were in DuckTales. I still don’t think it’s a fair comparison to make. Heh, if you’re not a fan of the CMCs in this episode, the next episode will probably drive you bonkers. 😉 To be fair, though, I think the CMCs drive everyone bonkers the first few times they show up, something not helped by the fact they get back-to-back episodes here. As someone who has been all but desensitized to their antics by this point, I didn’t see their behavior as all that out of the ordinary: their stated goal back in Call of the Cutie was to “work together to find out who we are and what we’re supposed to be,” so while being blank flanks was the feature that brought them together, I doubt it was ever their intention to stay that way. That said, I absolutely know where you’re coming from with your frustration at their characterization (I was there too), I agree it could have been quite interesting to see them embrace and promote their lack of destinies tattooed on their butts: the Cutie Mark Contrarians, perhaps? Going grim a bit, I think it could have been even more powerful had the cockatrice petrified one of the CMCs (rather than Twilight) and Fluttershy managed to scare the creature off but still had her backside stoned. The remaining CMCs and Fluttershy would then have more of a tear-filled moment of reconciliation rather than a laughter-filled one, and there would be a few heavy minutes when none of them knew whether they’d ever be back to normal until, say, Twilight found them on her way back from Zecora’s and de-stoned them with magic (which is a little more believable than the cockatrice doing it, which is kind of random). I suppose what we saw was a bit more in line with “giggle at the ghostly” and the show’s “ei” rating, though… gotta remind myself that things were still tamped down quite a bit in Season 1!